Ever look at artichokes at the grocery store and walk on by having no idea what to do with them? This post will show you how to buy, trim and how to cook artichokes along with a delicious Tarragon-Chive Dipping Sauce recipe! There is absolutely nothing intuitive about Artichokes; how to pick them, cook them and certainly not how to eat them. Being a large member of the thistle family it’s a wonder in the culinary history of mankind that their off-putting exterior was ever penetrated to discover the soft, delicious meat of the underside of their scrappy-looking leaves. When I was growing up my maternal Grandparents lived in Northern California. They had a flat in San Francisco where my Grandfather worked during the week, and a weekend home on the Monterey Peninsula. I loved to visit them for vacation. We’d spend a great time in San Francisco then wind our way inland down to the Monterey Peninsula, leaving civilization behind to transition through the brown rolling hills landing in Castroville en route to the ocean. Waiting patiently after clearing the wooded hills were acres and acres of artichoke fields. I found them so curious; spiky, voluminous vegetation, presenting one thorny choke thrust high on the top of the plant as if presenting a prehistoric offering. I now feel fortunate to have grown up with artichokes, eating them since before I can remember. I went to college in Santa Cruz California and along with many other out-of-staters was exposed to local California food. I witnessed some extremely awkward moments of self conscious Collegiates trying to eat artichokes whole, not wanting to out themselves by asking what the heck to do with one. There is no other food consumed like an artichoke. 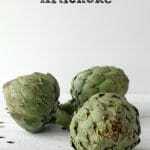 ARTICHOKE SEASON: We are currently in artichoke season which lasts primarily from March until May. 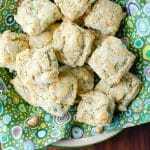 You’ll see them popping up at markets and it seemed a great time for a little tutorial, as well as to share a favorite dipping sauce of mine; Tarragon-Chive Dipping Sauce. Simple, made with fresh herbs, it is the perfect dipping partner to the elusive artichoke. 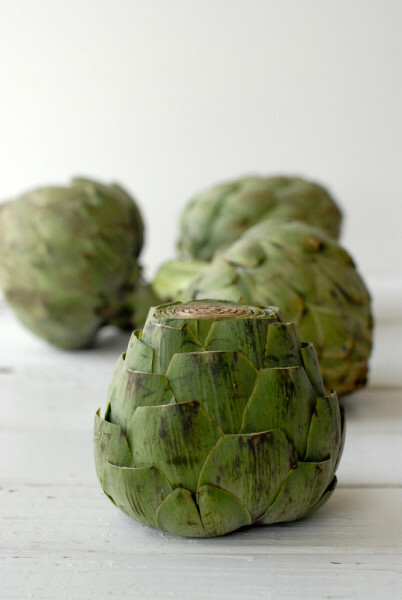 When purchasing artichokes try to select artichokes whose leaves are fairly tightly closed, forming a bit of a baseball looking appearance (for larger artichokes; smaller varieties will appear more oblong). You’ll note those in my photos look a bit scarred. I’m not concerned with that as it could be from a frost or other natural circumstances. They are tight and looked very healthy once I began to trim them. Being a thistle they have natural protective aspects like a thorn on the end of each leaf. 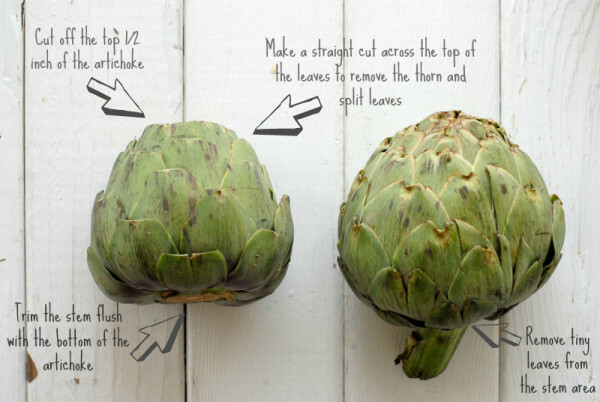 To prepare artichokes for cooking the stem needs to be cut flush with the bottom of the artichoke. The small useless leaves by the stem should also removed. A straight cut below the thorn and any split in the leaves should be made, attempting to cut the leaves uniformly for visual appeal. Lastly the top ½ inch of the artichokes should at cut off, straight, leaving the leaves available for pulling and eating once they are cooked. Artichokes are typically steamed or boiled. Either method takes about the same amount of time; 25-30 minutes. MY PREFERRED COOKING METHOD: I use an in between method of putting the artichokes in about 2-3 inches of liquid (I mix white wine and water with some sliced garlic cloves for flavor). Check for doneness by pulling on the lower outer leaves; if they can be removed easily the artichoke is done, if not add a bit more cooking time. I cannot think of any other food that requires such an unconventional consumption method as does an artichoke! Once the artichoke is cool enough to handle, the leaves are pulled off and scraped along the teeth to remove the softened ‘meat’ of the inner leaf. Holding the end of the leaf where the thorn was removed, place the leaf between your teeth and gently bite down close to the thorn end or where you sense the inside of the leaf has softened. A Word of Caution: If you bite too hard you will not be able to pull the leaf out, scraping the artichoke into your mouth. As you bite down pull the leaf out of your mouth leaving the lovely artichoke to swallow. 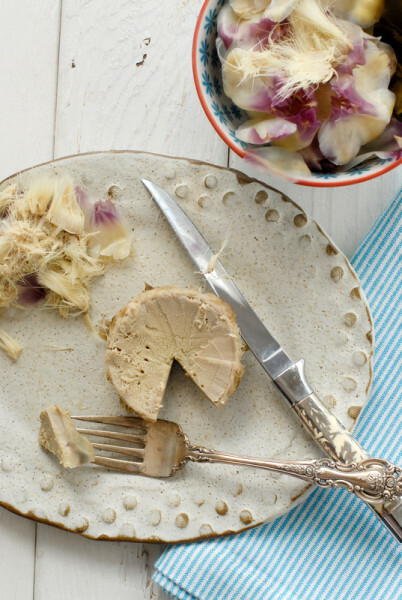 Artichokes are often are paired with flavors of lemon and butter for dipping. Artichokes have a subtle but distinct flavor that is celebrated with some fat in an aioli, mayonnaise, hollandaise sauce or just plain melted butter. 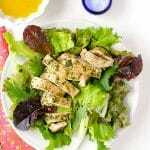 The leaf can be dipped prior to scraping for a delicious bite. The outer leaves of the artichoke are tougher than those toward the center and in the variety I purchased for this post they were very tough even with some extra cooking (they were very large too). You’ll note the leaves look aggressively eaten. Normally the inside of the artichoke leaf is soft and yielding, releasing the sweet meat of the artichoke readily. As you move inward on the artichoke the leaves become so soft they can be eaten with no scraping. As you near the very center generally the leaves which are paper thin, are merely removed to get to the heart. The ‘choke’ of the artichoke. As if this could be any stranger to eat, once you have eaten or removed all the leaves you will arrive here; the choke. One does not need to wonder more than momentarily about the Darwinian purpose of the choke. Fortunately this fuzzy distraction only need be removed to reveal the most coveted aspect to an artichoke; the heart. Run a sharp knife underneath the fuzzy choke (just underneath it so as to not remove any of the heart) in a circular pattern to remove it. Underneath will be the heart; the sweetest part of the artichoke. It has a fantastic thick, dense almost custard-like consistency. Slice it up and enjoy it; it’s worth the work of getting there. The coveted ‘heart’ of the artichoke. Artichokes are one of those strange vegetables shoppers often glance at and pass by due to not knowing how to approach them. Once you’ve made them there is no turning back. 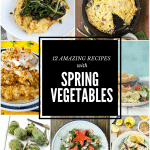 After learning how to cook artichokes you’ll want to do it all spring long! The idiosyncratic manner of eating artichokes always sets a relaxed, fun and unique tone to a meal. And they are a wonderful signature of spring. Cooking artichokes is very simple and only takes around 30 minutes. They are sure to enliven any meal, requiring such a relaxed, unique manner by which to eat them. Tarragon-chive dipping sauce is made with fresh herbs, beautifully complimenting the subtle flavor of this spring vegetable. In a large pot (large enough to fit all artichokes you are preparing sitting flat on the bottom next to each other) pour in wine and fill with water to 2-3 inches deep. Bring to a boil reduce to medium heat (still a low boil or high simmer), cover and cook 25-30 minutes or until the lower leaves pull off with ease. 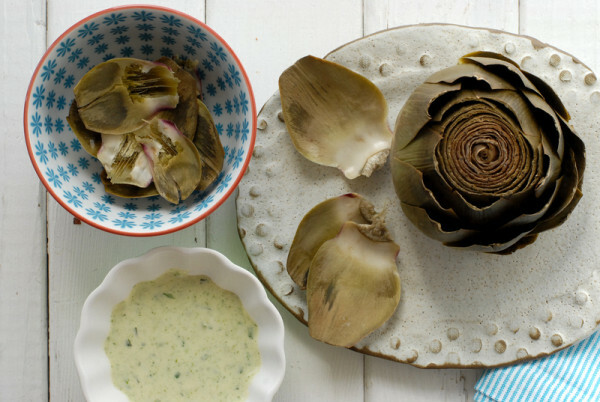 Drain and allow artichokes to sit a few minutes before serving. Place all ingredients in the blender and blend until fully combine (will turn a light green color). Refrigerate until using. *refer to main blog post for trimming instructions. Toni, your post was extremely timely. A friend just gave me a gift today — a beautiful “artichoke” bowl — and my first thought was, “I need to learn more about artichokes.” I promptly Googled when I got home and guess who came up in my search?! Thanks for the fabulous tutorial, as well as your delicious dip recipe. Sounds like serendipity Kim! I would not like to see you, as some I’ve seen, trying to shove the entire thing in their mouths (shudder). This Okie cannot buy fresh artichokes here. I had them once in Tahoe. Delish! Really? I’m so sorry. Is there a Whole Foods around you? I would think they’d carry them. But in the meantime you can savor your one experience (glad it was a good one)! 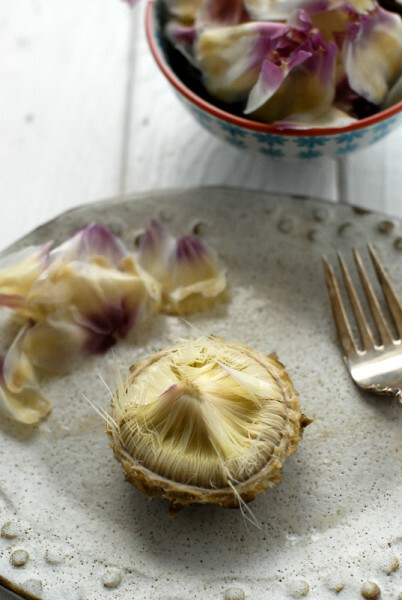 Instead of cutting the stem off: if you break it at the base of the artichoke and pull it off, you’ll also pull out the tough fibres that might get stuck between your teeth when eating the heart. Interesting thought Nick. I’ve never found any fibers when eating the heart; are you speaking of the choke actually (the fuzzy area above the heart)? I’d love to know more. I’m having trouble visualizing which fibers you are speaking of. Here in Turkey we have a lot of artichoke dishes, but we peel and clean the artichoke first, cure it with lemon to prevent browning and usually either make a veggie dish with olive oil or cook it with meat. It is really yummy that way too! This sounds fantastic! Love the idea of preserving it with lemon. Yum! 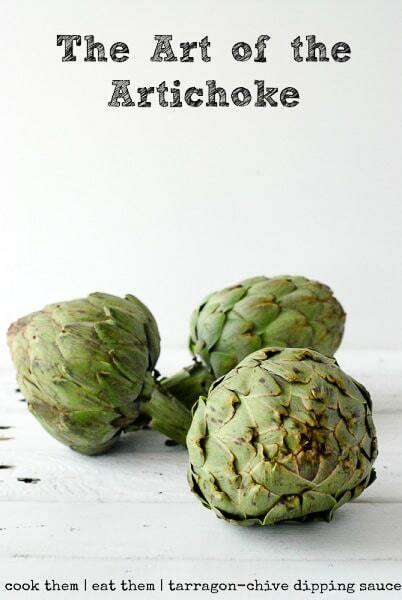 There is nothing ‘normal’, natural or intuitive about an artichoke. You are certainly not alone! Hi Toni, I didn’t know you were in Santa Cruz (UCSC?) — that’s my hometown and I love Artichokes too! My day job is on campus. What a detailed and encyclopedic homage to California’s recently proclaimed State Vegetable! Hi Robin! I am a Banana Slug! I lived there for a bit following graduating then migrating norhtward as I worked in high tech before leaving the state. I’m delighted to know about the official role of the artichokes; thank you! Seems fitting. Thanks for sharing your usefull how to Toni! Hi Helene! The fuzzy part above the heart is the choke (please tell me that isn’t your favorite part?!). You can imagine that it’s sole role is to protect the sweet heart from preditors (do artichokes have preditors?!). I would imagine eating that part to be a bit like a cat with fur their mouth, licking madly to get it out! I agree on the heart however. Worth the work of getting through the choke!